When viewed from behind, a correctly seated rider is straight to the horse; the only thing different is the “missing” right leg. Photo by Catherine Nantel-Philibert. 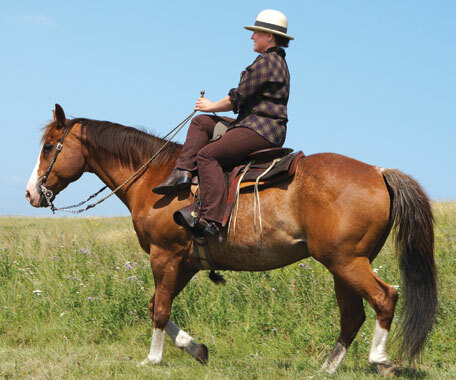 Lee McLean has been riding sidesaddle for over forty years. Her Quarter Horse, Cody, a retired community pasture horse, just recently made the switch. Photo by Catherine Nantel-Philibert. A close up look of the correct leg position?—?the left leg should rest lightly in the left stirrup and the rider should be able to fit a hand between your left thigh and the leaping head. Photo by Catherine Nantel-Philibert. Even simple maneuvers such as backing straight and energetically become more difficult with only one leg! Photo by Catherine Nantel-Philibert. 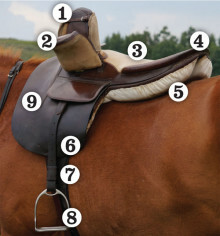 The secure seat comes from the “purchase” of the rider’s lower right leg against her horse’s left shoulder. Photo by Catherine Nantel-Philibert. Lee McLean prefers to ride aside. 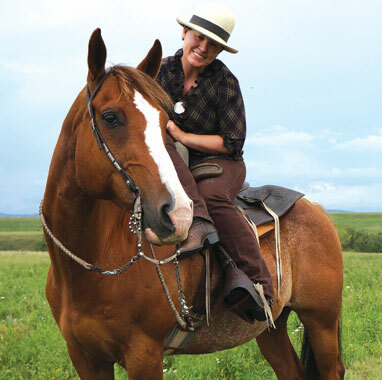 She is one of a handful of women in the Alberta foothills who keep the bygone riding style alive. For over 40 years, Lee has been sharing her know-how with inquiring minds. 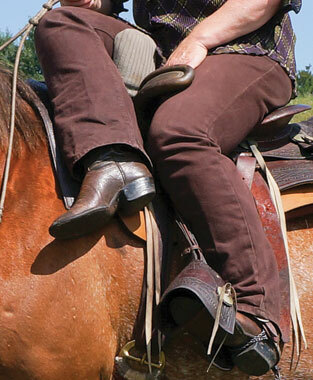 From her home and ranch near Longview, Alta, she routinely receives calls and emails from curious folks, eager to find out more about the riding style. As with any riding discipline, rider position is key. 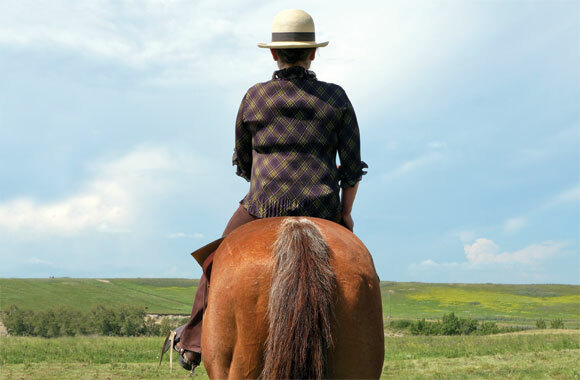 The best way to understand this rider position is to experience it first hand; however for those of you reading this article from the comfort of your home or in the isles of a supermarket, the following exercise will help you gain a better understanding of what Lee and her comrades experience as they ride sidesaddle. Sit in a tall chair or bar stool (preferably one where your feet don’t touch the ground). Cross your right leg over your left leg and point your right toes down. Press your right calf into your left leg. Rotate your body about 70 degrees clockwise. That strong grip you feel is called purchase and it’s what creates a secure seat when riding aside. While riding aside, the right leg will work the hardest, while the left leg remains light in the stirrup and cues the horse to walk, trot or canter. Conversely, if the left leg rests too heavily in the stirrup, this can overload the left side and cause the saddle to tip to the left. Once this happens, the rider is no longer centered, which can cause your horse considerable back pain. 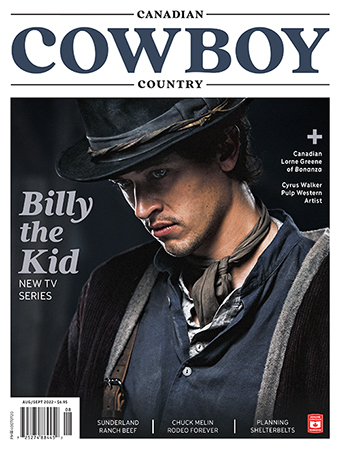 Despite the secure seat that occurs while riding aside, Lee does not break horses in a sidesaddle. A horse that responds well to a rider’s aids will walk and trot quite easily with just the left leg. For other more complex maneuvers, seat cues, a whip or a romal can help. Sidesaddles are available in both English and Western style and can be purchased nearside (where the right leg crosses over the left leg) or offside (where the left leg crosses over the right leg). Offside saddles are very rare. Having a difficult time finding a saddle to fit your horse? Imagine searching for a sidesaddle! Sidesaddles are available for both the English and Western discipline but most were made many moons ago and were built for horses with much smaller frames than our equine friends of today. Also, many of these antique saddles do not have a leaping head?—?a safety feature that became increasingly common as of the 1860s. 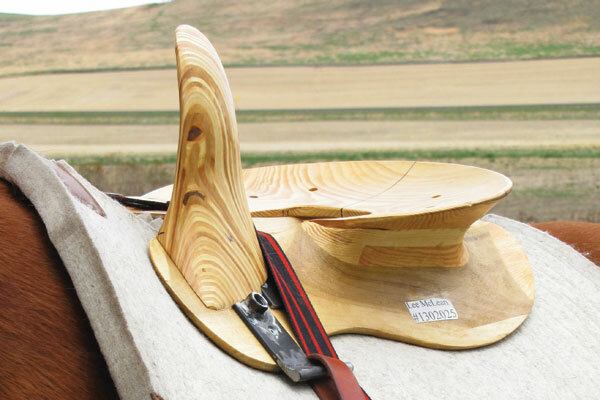 Frustrated with the difficulty associated with finding a proper fitting sidesaddle for her horses, Lee is now working with Rod Nikkel, a saddle tree maker based out of Valleyview, Alta. Together, they are designing a modern tree for custom sidesaddle orders. 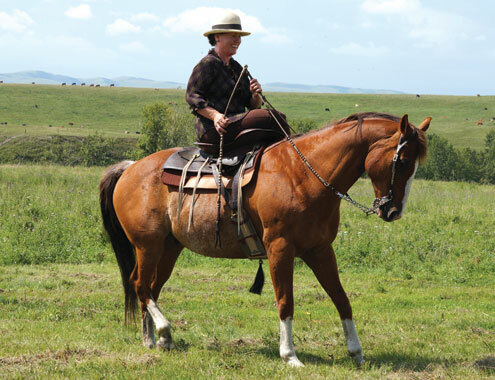 Lee McLean is organizing the annual Sidesaddle Weekend at Bar U National Historic Ranch. The event, which takes place July 4-6, 2014, has attracted participants from all over North America.